The polar vortex shows the limits of today's electric cars. The polar vortex that walloped the Midwest before heading East also revealed another roadblock to clean transportation. Electric cars are unable to handle the cold, owners are discovering. Tesla owners are even finding that their vehicles are frozen shut, according to Mashable — suggesting that electric vehicles aren’t fully equipped to replace gas-powered cars just yet. The problem of people getting frozen outside of their Teslas could readily be fixed in future model — the specific issue comes from Tesla having chosen a cool design over functional door handles. Normally, Tesla door handles will slide open when someone approaches, but layers of ice are keeping everything stuck in place. 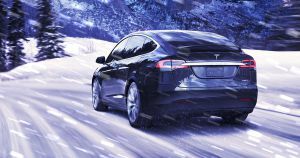 To be fair, Tesla has conducted battery and handling tests in icy conditions, but it seems that the -60 degree F (-51 C) that some Americans are now experiencing is still proving to be too much for the vehicles. In future iterations of EVs, Tesla and the Nissan Leaf could be improved with more resilient batteries and more accessible door handles. But for those who are currently stranded in the cold, there may not be an option beyond waiting for spring.